No matter how many times I go to Israel, Har Herzl and its new museum is still at top of my list. The park itself is a cemetery, but don’t let that discourage you from visiting. The cemetery is physically beautiful, lush and peaceful, with seemingly never ending pathways that wind in and out between Cedars of Lebanon and native pine and cyprus trees. Fluttering butterflies and the sweet fragrance of lavender and rosemary follow you as you stroll through each area of marked graves. You can almost always count on running into a tour or mission of people from all over the world. Stop and listen to the guides who lead these groups so you can also learn about the heroism and sacrifices that were made by men and women of all ages in order that we now have a Jewish state of our own. 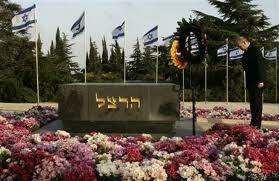 This is a holy resting site for thousands of Israel’s fallen soldiers and leaders. Jews often place a stone on graves to show respect and to leave an imprint. I like to take my children by the hand and seek out the grave stones of young men and women closer to their ages. I encourage them to wander around an area and choose a young soldier’s grave to think about and dust off or sit next to while we read his or her story. As we sit on the cool stone benches, we think about the kind of courage it took to be a part of Jewish history. Prime Ministers Golda Meir, Yitzhak Rabin, and presidents Zalman Shazar and Chaim Herzog are buried here as well as fallen heroes like Parachutist Chana Senesh. Above all, rests Theodor Herzl, the father of Modern Zionism who like Moses, never witnessed the fruition of his dream. Herzl’s short, but profound life and story is told through a new, multi media, interactive exhibit inside the park’s new museum. It is literally like walking through Herzl’s memories and experiences on his road to securing a permanent Jewish homeland. Your children will not be bored at this museum because they won’t walk up to a plaque and read canned information. The curators designed this space with state-of-the-art technology so you experience Herzl’s voice, dreams, public successes and personal failures through video taped reenactments. You can also walk through rooms which house Herzl’s original furniture and artifacts from his evolution as a newspaper correspondent in Vienna at the turn of the 20th Century to a statesman who met with Presidents, Kings, and Kaisars. In 1897, at the first World Zionist Congress in Basel, Switzerland, Herzl wrote in his diary: “If not in five years, then in 50, a Jewish state will become a reality.” Like a modern prophet, Herzl’s vision bore fruit 50 years later in November 1947 when the United Nations approved the idea. What began for Herzl with a newspaper account of a wrongly accused French officer named Dreyfus, resulted in global awareness and final acceptance of the need for an independent Jewish state. Herzl died in 1904 at the age of 44. His remains were brought to Israel in 1949. His simple grave marker, inscribed in Hebrew with just his last name, caps the hill. Herzl Museum 02-632-1500. Sun. – Thurs., 9-3:30, Fri, 9-12:30. Tours take an hour and cost NIS 20. Call ahead to verify times for tours in English. Mt. Herzl itself is free and accessible by buses that stop on Herzl Blvd. There is also a large parking lot adjacent to the entrance.